Google Express originally called Google Shopping Express quietly ended their subscription pricing on August 23rd. Up until today, Google charged an annual subscription just like Amazon Prime. The Google Express news of the day was dominated by the announcement that Google and Walmart would be partnering on voice search to combat Amazon, but there was little attention paid to the change in their pricing model. Here’s what the Google Express pricing page says now. 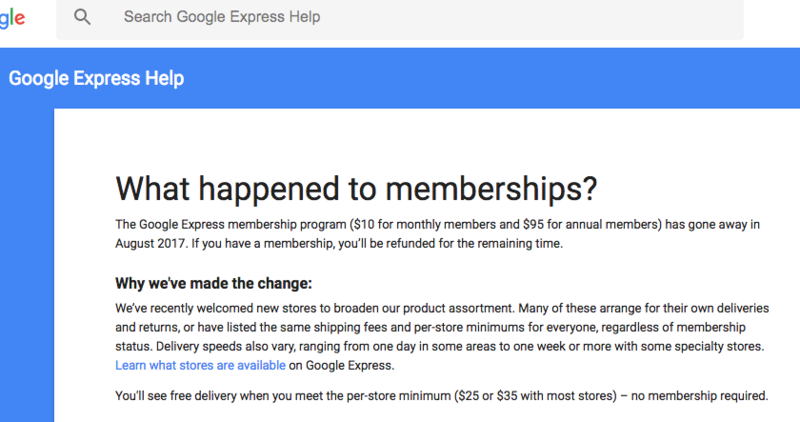 The Google Express membership program ($10 for monthly members and $95 for annual members) has gone away in August 2017. If you have a membership, you’ll be refunded for the remaining time. We’ve recently welcomed new stores to broaden our product assortment. Many of these arrange for their own deliveries and returns, or have listed the same shipping fees and per-store minimums for everyone, regardless of membership status. Delivery speeds also vary, ranging from one day in some areas to one week or more with some specialty stores. Learn what stores are available on Google Express. You’ll see free delivery when you meet the per-store minimum ($25 or $35 with most stores) – no membership required. This is a really big deal since Google has significantly lowered a barrier to using their home delivery product and with the addition of Walmart allows them to beat Amazon on price and speed. I assume that Google will eventually have to make a bigger splash about their no membership required delivery product since this is just too big to bury in a quiet change.